Working on the first episode of my upcoming Bat Storm animation I discovered that GoAnimate didn't really have any suitable Police Car props. 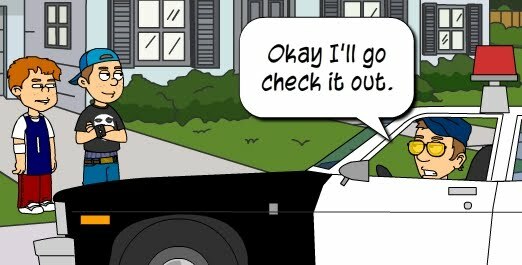 There were a few poorly cropped .jpg images in GoAnimate's community props section and a really awesome but stationary police car by GoAnimator, SolarBaby, but nothing suitable for a police chase. After making an animated motorcycle for Demon Biker I figured, how hard could an animated Police car be? 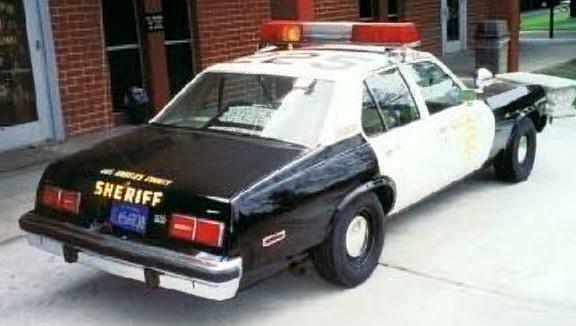 Rather than go for my local police car style I thought I'd go for the more recognisable Dodge Police car that's been seen in so many movies and TV shows during the nineteen seventies, eighties and even early nineties. Unfortunately I couldn't find a good side view of a Dodge Police car to trace so I ended up tracing this image of a Dodge Nova and converting it into a four door Police Dodge, based on other images of Police Dodges I had. DoInk is a fun online animation application web site I discovered a while back but never really looked at until GoAnimator, SolarBaby, alerted me to the fact that you can download your animations for free as .swf (flash) animation files which can then be imported into GoAnimate. With Pencil Animator being the only decent, free software available for creating flash props for GoAnimate I decided to look into DoInk and see if its free animation studio could be used as an alternative. Rather than take the easy route and just make a static prop I thought I'd try something a little more challenging and create an animated flash head that could replace one of GoAnimate's Classic Characters head. I'm happy to report that DoInk is more than a capable tool for creating props and backgrounds for GoAnimate (same rules apply as for Pencil Animator and CS5 in that it's important to centre your props over the top left corner of the DoInk Studio). You can see the sample head prop I made in just over an hour - whilst learning how to use DoInk - in the short demonstration cartoon below. DoInk is very easy to learn and use so it's great for people new to vector and flash animation. I'd particularly recommend it to younger or newer animators who don't want to spend a lot of time reading manuals or following tutorials. That's not to say there isn't a learning curve but most of DoInk's tools are self explanatory or can be worked out through a bit of trial and error. The only caveat I have about DoInk was that there is no feature to trace a bitmap image. As can be seen from my police car prop above, the ability to trace a photo is great for people who aren't that skilled at drawing. It's also a useful tool to have if you're better at drawing with a real pencil and paper and want to scan your drawings in to be traced. I haven't really done anything with DoInk since I made this demonstration piece but it's a site I'd really like to get back to. It has great potential and could, possibly be seen as a stepping stone for GoAnimators who want to move to animations that aren't created from someone else's drawings. Thank you for your nice comments about DoInk. Hope to see you back on the site. Wanted to let you know we recently released an iPad App of our drawing & animation tools, the DoInk Vector Animator http://itunes.apple.com/us/app/doink-vector-animator/id364762290?mt=8 which was selected as a best "App to Buy for the Holidays" http://levelupnews.com/apple/2010-holiday-app-gift-guide/ Any questions, contact Karen@doink.com Thank you!